Have you started your Spring Wardrobe shopping yet? You've probably noticed the racks are full of fresh colors and airy fabrics. In fact, they've been for the past month. No doubt there's a lot to choose from but don't worry-- I'm here to help you narrow it down! Feeling nostalgic? The track stripe is making a reappearance. While you'll find it adorned on many the pant leg, this versatile stripe has upped its application to necklines, trimming and virtually anywhere it can fit! It's unlimited color and texture options give it the ability to span from 'work out wear' to 'work wear'. Pair it with a carefully selected top to either dress it up or dress it down! Woven shirts are still strong for spring. Ruffles continue to be a key detail. Cropped bells are a fresh alternative to the skinny jean. Athleisure isn't going anywhere any time soon. (Who would argue with comfort being in stlye?!) Oversized sweatshirts are elevated with ruffles and fun arm details. Applique pearls dust sleeves and necklines. Activewear leggings continue to play a key role in streetwear. Mini backpacks make a comeback and replace the reigning purse. Woven shirtings really hit hard last summer and are continuing into this spring. The classic shirting stripe takes on new weights and textures as sleeves become more voluminous. Try mixing knits and woven for new layered combinations. *Clean layering is key. Uneven hemlines hit tops and bottoms alike. The straight leg replaces the skinny. Raw edges continue to show. Ribbing evolves from cuff and hemline details and takes the shape of all over ribbed fabrics. Minimal silhouettes pair with strong textures and statement jewelry. Wrap and Mock-Wrap tops, bottoms and dresses create the illusion of layering without the bulk. *Mock wraps are a great alternative for those who find the excess fabric of a true wrap to be an unflattering fit. Do any of these Spring Trends speak to you? Any colors that you can't wait to try? Tell me in the comments! One of my favorite ways to celebrate the changing year is by starting a fresh calendar. I like to switch it up each time. For 2017, I had a New England Fall Foliage Photography calendar hanging. It was beautiful but this year I was looking to take another direction. I want 2018 to be different. My cover girl is armed with coffee and ready to take on the new year! Some time last winter I began tossing around the idea of creating a Fashion Illustrated calendar. I enjoy sketching mini collections and series and although art is fun to hang alone, I'm all about functionality. Putting together the pieces in a monthly calendar gives them purpose. May is on her way to a music festival. As this year went on I continued to sketch pieces for the calendar here and there, and in between other projects. Some of pages were designed specifically with a month or a season in mind. Others fell into place by coincidence afterwards. I actually had a few different options I was playing with for July but in the end, I chose the piece that fit in best with the style of the other months. July's channeling beach vibes in a flowy summer dress. My favorite sketch in this calendar is probably October's. I'm partial to the colorful leaves and the layering. This one started as a pencil sketch. I scanned it and digitally went over with my bamboo tablet in Photoshop. October's sketch actually wasn't made with the calendar in mind but it fit right in. Pumpkin spice latte in hand! There are a few different drawing methods sprinkled through out the months. January, July, April, September and November were digital drawings done completely on a tablet using the Autodesk Sketchbook program. This is a new style of sketch I just started experimenting with this year. It's a bit quicker and cleaner than the traditional way. I intend to explore it more in 2018. Through the entire process I was constantly showing the calendar to friends and getting feedback. I came to the conclusion that not everyone hangs a wall calendar. Some people stick to an office desk calendar. Others keep a planner instead. I wanted to make my calendar relevant for those friends as well so I reworked it into a few additional formats. The stand alone Easel Calendar features each month on an individual card. The cards sit together in a wooden base. I also added a printable planner download and formatted it to fit most standard planners. There's a download for 8 x 10 printing too for those who aren't planner savvy. I want to know what your 2018 calendar looks like? Share in the comments below! There are a million things I love about September~ One of those being the runway shows! New York Fashion Week kicks off the season every year and is followed by London, Milan and then Paris. I miss the days when NYFW was held in the tents in Bryant Park but many of the shows are still held around the area. Working in midtown NY, I always get to experience the excited buzz that seems to sweep over the city each runway season. The streets are always brimming with high fashion but its especially easy to spot the trend savy stepping their style game up a notch just for fashion week. I did a quick sketch series on my 4 favorite Fashion Week types. Phone charged and ready to go! This girl's dressed head to toe in designer pieces and is always at the right place at the right time. Here she's styled in a chic black and white combo, adorned in one of the seasons prevalent trends: ruffles. She's repping that bold sleeve detail in flared, raw edged, tiered denim belted with a sash. Even the photographers are dressed to a T; a casual chic aesthetic with a ton of pockets and the flex needed to get that perfect angle. Whats your dream fashion week role? Which Fashion week blogs do you follow? Comment below! Wait! Before you toss that bouquet--! This project is actually from a few months ago but as Valentine's day has just passed and many of you may soon find yourself with falling petals, I felt it was timely to share. I was recently a bridesmaid for a close friend's Wedding and the Bride gave us the most beautiful bouquets. It was a fall wedding and the flowers were vivid autumn colors. I kept mine for as long as I could but when the petals started shedding it was time to give it one final run. To compliment the deep orange/yellow hued petals, I tipped the edges in red ink. I had seen petals worked into fashion illustrations before but never tried it myself. It was actually very relaxing. The petals provided a loose medium that could be re-positioned and adjusted on whim. I was able to rework them into an endless amount of shapes on the same base sketch. It was somewhat like draping in that I could design on the form with a 3 dimentional value and not have to reach for an eraser. I also scrunched some, dipped them and used them as a press to add texture. I worked other components from the bouquet into the image as well, such as the leaves and twigs. For this final look I tore some of the petals and scattered them, adding black ink and really allowing it to smear and splatter across the page (and my entire kitchen table). The petals may have ended up in the garbage but they were preserved in the photos I took off the process. Next time you have a bouquet on the way out, give this a try! It's loads more fun (and messier) than you'd expect. Before I set out for the night, I wanted to share a little seasonal DIY I worked very hard on this year: Home-made Christmas cards! I love paper and stationary. I really like working with all the different patterns and colors. Paper isn’t so different from fabric in that respect. Mixing graphics on a card is similar to combining prints for a collection. I like to justify all the time this took by counting it as pattern training but while working I was having too much fun to really focus on what I was learning. The prints are actually from two different holiday scrapbooking pads from Michael’s Craft Store. One I had gotten on clearance last year and the other I picked up this black Friday. They were under ten dollars each. I had originally planned to only make about ten cards but I kept remembering more and more people on my list. It was loads of fun but it was no easy feat finishing in time for Christmas after such a late start. I like experimenting with different things because its helps me clear my mind and focus solely on what’s in front of me. In that respect, card making provides a different sense of relaxation for me because it’s not something I do professionally. I thought about not only which colors went well together, but what mood each of the cards would have and how each would make the recipient feel. Afterwards, selecting who would receive each one was even more of a challenge than making them. More went into the final selections than you’d imagine! I made 28 Christmas cards this year for friends and family. My card army was sent out just a few days ago. Hopefully each has found its way to its destination in time! I am always open to custom paper/stationary work! Drop me a line if you’ve got something in mind! The holiday season is my most favorite time of the year. It can also be one of the most stressful times as you scramble to complete your shopping. To make things easier I've put together an Illustrated holiday gift guide to help you check off that fashionable-someone on your list. The best part is that all of these items are from makers and small businesses so each has a personal touch. This Illustrated Fashion tote is printed on sturdy PolyPoplin and measures 13"x 13"
A sassy band tee for the lead vocalist in your life. Available in kids sizes. Part of the Family Garage Band Collection. A beautiful ceramic mug with a calming watercolor feather design. The perfect mug to house your morning coffee. A downloadable motivational print for that busy bff who could use a reminder that she's awesome (hanging on her wall). Know some one who liked Pugs before they were cool? They'd probably love to have this print as home décor. This Fun rocket Ship printable adds a little whimsy to any room. These self-love tees are all about loving yourself as you are. They come in both women's and girl's sizes. This colorful smart phone case will protect your phone while keeping it super cute. Available for the Iphone 4 and Newer models. This handmade resin replica pendant is perfect for fans of the 90's cartoon super hero, Sailor Moon. It's available as a brooch or key chain. The International Fashionista's Lookbook Diary is perfect for the young fashion savvy jet setter on your list. It's a style driven coloring book and design journal packed with creative prompts to get an aspiring fashionista designing her own runway collection. The book introduces ten fashion girls from around the world on coloring pages and includes tidbits about each country. Fashionista's can have fun and be creative while closing the global gap. Happy Shopping! Have a favorite holiday gift? Share in the comments! It’s out! I no longer have to keep it a secret! For the past month and a half I’ve been working on a very exciting joint project. In collaboration with Dana Larder of HowInTheWolrd.org, we’ve created The International Fashionista’s Lookbook Diary. We released it earlier this week on October 11th, The International Day of The Girl. 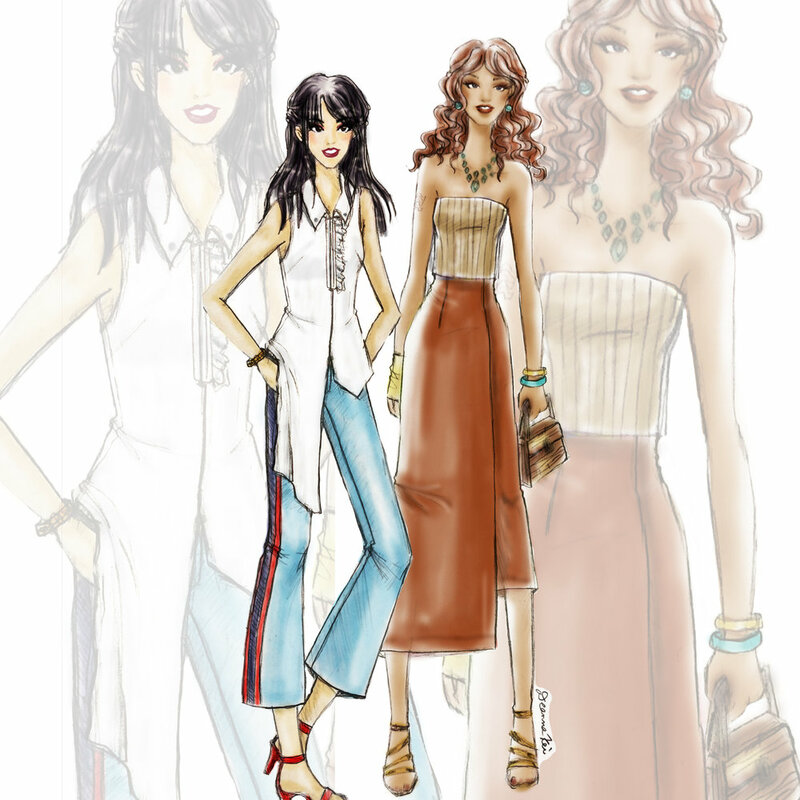 The book features 10 international fashionistas in coloring pages as well as tidbits about their respective countries and drawing prompts to get fashionistas creating their own designs. It’s recommended for girls ages 8-13. I was really happy to be a part of this project. I had always wanted to work on some sort of fashion coloring book so of course when Dana proposed the idea I was ecstatic. One of the most difficult things for me was deciding on the outfits for each of the girls. We wanted the book to have a current, trendy vibe, so unlike many other fashion books that introduce characters dressed in the traditional garb of their cultures, I looked to international fashion bloggers for inspiration. That’s where the difficulty came in. In this age of instagram, girls all over the world are sharing their styles. There are subtle differences of course, but the same black leather jacket you might find on the streets in Japan could also be worn in Turkey. With this realization in mind, we wanted this book to express the idea that we’re not so different and to teach young girls that no matter where they’re from, we are all human. I had a lot of fun drafting the outfits for the girls and then drawing their final looks one by one. Aside from touching on all the trends and silhouettes, I also took merchandising into consideration, making sure to include pants, dresses, skirts, jackets, hats—and so on. I did each of the backgrounds as a separate layer and then combined the pages on Photoshop. The backgrounds took an equal amount of research. I wanted to capture recognizable scenes but keep them basic enough to not take the focus away from the girl. Creating all of the sketches was a blast! Dana came up with a bunch of great diy and diary pages to keep the readers involved and inspired. She also included information about each of the countries to compliment each section. I'm looking forward to getting some feedback! I hope girls enjoy it as much as we did while making it! Sonia's collection for H&M was so fun! I loved the styling in this ad. The model's hair is reminiscent of the designer's own. I absolutely love all of the images in this campaign. The Eiffel tower makes a gorgeous backdrop and the effect of the camera angle is fantastic. I can't wait to tear it out of the September issue of Vogue, (which I'm hoping it will turn up in). a Nigerian style blogger who's posts not only boast chic style, but also have gorgeous backdrops. 1- What City/State are you based out of? Sogie- Well, I'm from Edo State, Nigeria. 2- How would you describe your blog? Sogie- My blog, The Diva Diaries (http://www.itsdivadiaries.com/), showcases my personal style and life growth. 3-Where do you find inspiration? Sogie: I get inspiration from almost everything. I even have a post that was inspired by trees. I try to look at everything with a creative eye. 4-How would you describe your personal style? Sogie: My personal style is a mix of everything. I don't like to keep myself in a box so I'm always trying out new things but comfort is key in everything I wear. a Plus Sized Fashion, Beauty and Lifestyle Blogger from Florida. Her blog is bursting with helpful Advice, reviews and tips. Natalia- Its a plus size Fashion and Life Style Blog. 3-Where did you find your inspiration? Natalia: I found inspiration on instagram; seeing other women so confident, showcasing their sense of style and creativity. That really drove me to pursue my own blog. Natalia: My personal style is vibrant, feminine and trendy. I like to put my own twist on trendy pieces and showcase my personality through the clothes I wear and how I choose to style those garments. 5-Is there anything else you'd like to mention here? Natalia: Although my blog is focused on fashion and lifestyle, I strive to inspire women through my posts and social media to love their bodies and live confidently in their skin. I started the 'I Am Body Walk Movement' with Clevona of www.curvygirlfever.com to showcase the beauty in body diversity and to encourage all women to find their true beauty withing instead of focusing on what society thinks is beautiful. The Marc Jacobs Resort collection was everything good abut the 80's! It's decade inspiration was unmistakably vibrant, whimsical and fun without being the least bit tacky. It's rare I see an 80's inspired show that actually looks current but he pulled it off beautifully. The line pairs prints with solids, tulle underskirts with oversized bombers, gold with animal print and everything in between. Each look comes to life with it's own distinct attitude yet manages to remain completely wearable at the same time. This past month I've been working on a mini series of blogger sketches. I'm excited to be able to introduce each of these ladies to you through my Illustrations. Here’s the low-down from Monika herself! Monika- I live in a suburb in the NYC area. Monika- My blog, Violet Roots (violetroots.com), is a lifestyle blog with a focus on music, style and creativity. Monika: I find inspiration from all over. Sometimes it's in a song, an experience or in a particular color and in other times it's just a feeling. I'm an abstract artist and sometimes the paintings I make also lend themselves to ideas for the blog. Monika: My personal style is definitely focused on comfort, details, and experimentation. I love wearing vivid colors and interesting pieces like green cowboy boots or blue and green fur vests and jackets. It's fun to try new looks but I usually always try my best to be comfortable too. It's rare that you'll find me in heels. I'm usually wearing combat boots. If you know me in person you already know about my obsession with Instagram. As a fashion Illustrator, many of my favorite accounts to follow are Fashion Bloggers. I love having a feed full of inspiration. Naturally, when I see a great outfit or photo I have to sketch it! Today I want to introduce you to three awesome fashion accounts! 1. @hiliarykennedy - Bright, classy outfits --and she's always got a joke or two in her posts! 2. @Fab_teen_style - Cute and casual East Coast ootd inspiration! 3. @Silberin_manelieht - German lifestyle blogger who's detailed photographs cover fashion, architecture, alternative health, parenting, knitting and everything in between! I totally recommend checking them out!! I recently had an opportunity to interview a handful new and upcoming fashion bloggers. I'll be sharing their stories in a future post! ~ coming soon!